Analysis: Would a $700 Billion Budget Really Sink the Pentagon? Congress might have kicked the federal-budget can another four weeks down the road on Thursday, but it did give the Pentagon $4 billion for missile defense projects that the Trump administration says are needed to counter North Korea. The money will go toward adding missile interceptors to an Army base in Alaska, where they will stand ready to shoot down ballistic missiles fired at the U.S. mainland, say, by North Korea. It will also buy more THAAD tactical missile interceptors, the same type of systems already deployed in South Korea and Guam. While lawmakers included few details in the text of the bill about what projects the money would be spent on, they appear to have rubber-stamped a Pentagon emergency spending request from November. The top-level numbers in the bill passed this week appear to match up perfectly with those in the Pentagon’s somewhat-more-detailed request. For example, the bill includes $884 million for Army projects “to detect, defeat, and defend against the use of ballistic missiles.” In November, service leaders requested that amount for 147 PAC-3 Patriot interceptors, upgrades to Patriot launchers and ATACMS missiles. In its own part of the November request, the Navy asked for $60 million for “classified programs” research and development. Congress this week approved $60 million in Navy missile defense-related research-and-development funding. In addition, the Air Force requested $256 million for research-and-development work, including $90 million is for “Advanced Component Development & Prototypes” — and the balance for classified work. Lawmakers approved $256 million for Air Force R&D. Congress approved $1.2 billion in procurement for the Missile Defense Agency, which had requested 50 additional THAAD interceptors, 16 SM-3 interceptors and money to start building 20 new ground-based interceptors in Alaska. Lawmakers also approved $1 billion for defense-wide research-and-development work. The Missile Defense Agency requested $597 million for “advanced component development and prototypes” and the Office of the Secretary of Defense also requested hundreds of millions of dollars for the same type of work. The money comes as the Pentagon puts the finishing touches on a Ballistic Missile Defense Review, which is expected to present the Trump administration’s investment plan for related systems. 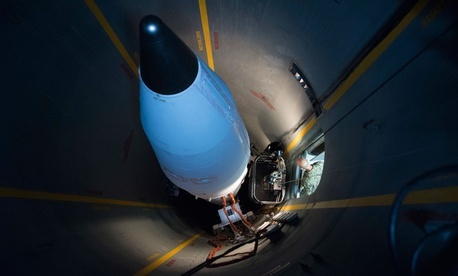 The approval of $200 million in funding for a new missile field with 20 interceptors at Fort Greely, Alaska, has been one of several signals by the administration that it plans to expand missile defense projects. While the Army and Navy have interceptors, the Air Force’s role in missile defense mostly involves launch-detecting satellites. In addition to the $4 billion for missile defense, Congress also approved $673 million to repair the USS John S. McCain and USS Fitzgerald, the two Navy destroyers that collided with commercial ships in the Pacific earlier this year.